Every year, the U.S. government spends trillions of dollars on a wide range of budgetary items. While the largest categories of spending, such as entitlement programs or debt interest, do not offer lawmakers a lot of flexibility, as Visual Capitalist's Jeff Desjardins notes, the government does get to decide how discretionary spending – about $1.3 trillion in FY2019 – gets put to use. Discretionary Spending: This category, depicted in the animation, is the optional part of the budgetary equation – it’s the aspect that most people talk about, as the allocation of funding towards different things like defense, education, and transportation can be changed by lawmakers. Mandatory Spending: Also known as entitlement spending, this category includes funding for programs such as Social Security, Medicare, and Medicaid. It’s called mandatory spending because the government legally is committed to fulfilling these obligations, and it exists outside of the normal budget appropriations process. Net Interest: This category is for payments on the national debt, also something that is necessary unless the country is willing to default on these obligations. As the animation shows, after adjusting for inflation (using 2009 dollars), discretionary spending has doubled since 1963. In 1963, which was essentially the height of the Cold War, the U.S. was spending 73% on the military to make up the vast majority of the $547 billion (2009 dollars) in discretionary spending. Things haven’t changed much since 1963 in that defense still comprises the majority of spending – in fact, the only recent time periods where U.S. defense spending fell below 50% were roughly between 1977-1981 and 1999-2004. 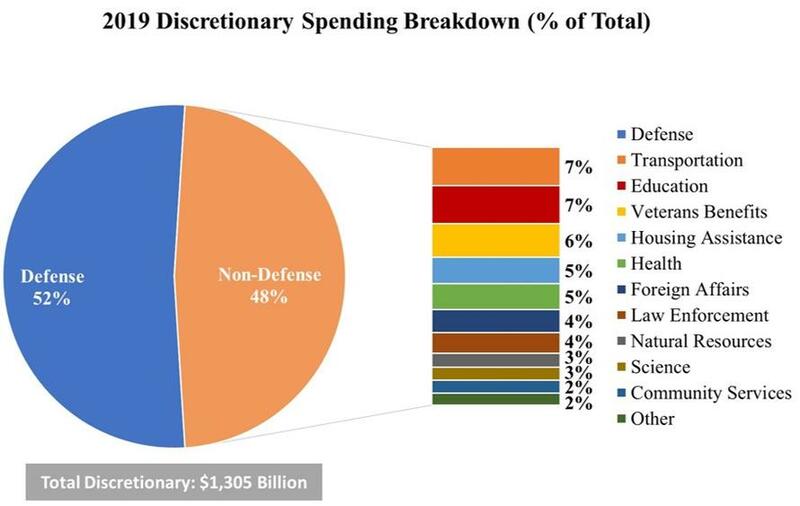 American spending on defense dwarfs all other countries, but there are other categories that make up decent chunks of the discretionary budget as well. While they seem small on the above chart, transportation (7%), education (7%), and veteran benefits (6%) are all actually categories that receive over $70 billion of annual funding – still a significant piece of change.